Memphis, Kansas City, Mo., and Maryville, Tenn., aren't exactly among the most popular spring break destinations for college students but those communities are where you'll find more than two dozen Indiana State University students taking part this week in Alternative Spring Break. They're helping senior citizens, volunteering at a child care center and working at a Native American reservation in the Great Smoky Mountains. They are helping those who are less fortunate and protecting the environment. "We get caught up in our own lives and we don't think about people who don't have it as good as we do. This is a chance for us to give back," said SharCarre Johnson, who is among eight Indiana State students spending their break volunteering at Operation Breakthrough, an early childhood center that serves nearly 700 children from poor families in Kansas City, Mo. "Alternative Spring Break is a great opportunity for servant leadership," said Steven Flowers of Terre Haute, who is in Memphis. He spent Monday painting the outside of a deaf man's home and Tuesday painting interior walls and doing minor repairs at the home of a woman who has been too ill to maintain the house. "Poverty is something I haven't had a lot of exposure to and this is an opportunity to learn more about other groups that I personally have not experienced," said Flowers, a criminology and political science major from Terre Haute. Johnson did experience poverty while growing up and doesn't want to forget her roots. "I come from a similar background so it's important for me to remain a part of such communities in a positive way," said the junior liberal studies major from Gary. Operation Breakthrough serves students from ages 7 weeks to 4 years. For many of the children, it's a chance to get the things - both physical and emotional - that their impoverished parents are unable to provide. "They're all kids. They don't realize the situation they're in quite yet. At Operation Breakthrough, they get meals and snacks, everything they really need. They get attention that they may not get at home. Mom may have to work two jobs or she may be out doing something at night and it might be an older brother or sister trying to care for them," said Michael Scott, a senior political science major from Gary and ISU Student Government Association president. "It's a positive environment and they learn social skills. It's really beneficial to them." In Memphis, students - in addition to painting - delivered food for Meals on Wheels as part of their work with the Metropolitan Inter-Faith Association. 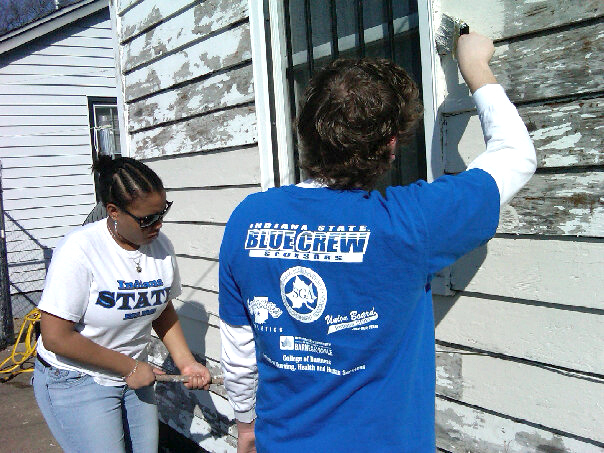 Ten Indiana State students are serving in Memphis. At the other end of Tennessee in the foothills of the Smokies, nine students are spending their break in a remote area, away from Internet and cell phone service. They're volunteering with "Once Upon a Time in Appalachia," an organization whose mission focuses on the Cherokee Nation and the environment. Those students are expected to spend two days in a Cherokee community, one day doing trail maintenance and one day working on a project at the Sequoyah Museum. They may also take part in homesteading activities such as splitting/gathering firewood, gardening and cutting trees to clear ground. Whether painting in Memphis or caring for children in Kansas City, or maintaining a trail in Appalachia, Alternative Spring Break also benefits ISU students. "It's a chance for students our age to be a positive influence on other people. It's a chance for us to say, ‘Hey there's another way,' " Johnson said. "Regardless of where we are, we're all a part of this global community." You can follow the Alternative Spring Break activities of Indiana State students online at http://www.indstate.edu/asb/follow.htm. Participating students raise 100 percent of the money required to cover the cost of participating in Alternative Spring Break. Funds are still being collected to cover this year's expenses. Checks payable to the ISU Foundation, with a note that the donation is for Alternative Spring Break, may be sent to the Center for Public Service and Community Engagement, Indiana State University, Terre Haute, IN 47809. Photo: http://isuphoto.smugmug.com/photos/805659124_aRSn7-O.jpg - Indiana State University students Alexus Tucker of Indianapolis (left) and Steven Flowers of Terre Haute paint a house in Memphis as part of their Alternative Spring Break experience. More than two dozen ISU students are taking part in Alternative Spring Break, lending a helping hand to senior citizens and children and protecting the environment.